Woody Allen once said, "Eighty percent of success is showing up." You can apply the same thought to much in life. We show up at funerals, baby showers, weddings, family barbecues - and it counts that we simply are there. Is this true of one's spiritual life as well? Last Sunday, I was at Mass, and trying desperately not to break down in tears. The whole situation with my daughter - her being missing for two days, the sexual assault that took place - and the aftermath that required me to try to balance work with her almost overwhelming needs and being present for her as she tries to collect the pieces of sanity she tentatively had a hold on, has taken a toll. And for me, part of this toll is the inability to really pray, and finding Mass to be incredibly difficult. I'm angry. Since I can't be angry at the people responsible for this great evil (they have not - yet- been found), I'm angry at God. He's a big God - he can take. I know He's not responsible, but there you go. What's a mother to do? And thus I found myself, last Sunday, not listening to the sermon, but counting the bricks behind the altar. Over and over, just so that I wouldn't cry. I was "there", physically present - I'd showed up, but I sure wasn't "present" or paying much attention. Did my just showing up "count"? 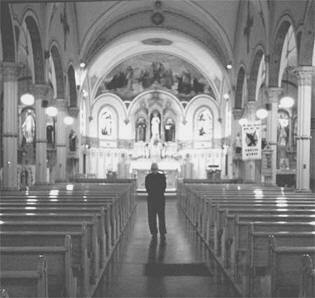 I haven't stopped praying or attending Mass, but it is a struggle to read every word, respond to prayers at Mass, sing a hymn. It is as if my throat were clogged with the ashes heaped upon our family this Lent. I pray, but not without tremendous struggle, and with very little conviction. And yes, I do think it "counts". I believe that God understands the heartbreak a mother feels, the disbelief that such horror could be visited upon a child, the exhaustion that has set in and taken hold of my very soul. He knows that the only way I can get through a sermon right now is by counting bricks, and His hand rests upon my shoulder as I do it. One day I will wake up and I'll be able to do more than just show up, but for now, showing up will have to do.